Writing in the Press and Journal newspaper which serves much of northern Scotland and in particular the “Granite City” of Aberdeen which boomed during Britain’s North Sea oil rush, the former Foreign and Commonwealth Secretary warned that the EU’s hated Common Fisheries Policy (CFP) will be “reinvented” during the transition period negotiations envisaged by May’s deal, with Brussels “effectively holding all the cards”. The EU — then the EEC — amended its rules just before Britain’s entry in the 1970s to treat fisheries as a so-called “common resource” under Brussels management, knowing its new member had by far the richest stocks in Western Europe. The bloc parcels out more than half the fish in British waters to EU boats under the CFP, with a significant proportion of the remaining “British” boats actually being foreign vessels which simply register in the United Kingdom in order to access its quota share. The British parliament tried to outlaw this practice with the Merchant Shipping Act of 1988, but was overruled by judges who deemed the act incompatible with European law — proving once and for all that Britain is not sovereign as long as it remains within the bloc. Johnson’s concern is that Mrs May’s Withdrawal Agreement does not cover fisheries, with fish and aquaculture products excluded from the “single customs territory” contained in the already highly contentious “backstop” which will come into force if a comprehensive deal is not concluded during the transition. This, Johnson believes, gives the bloc “infinite power to bully and blackmail” the United Kingdom to “get whatever it wants in the future negotiations” — with French President Emmanuel Macron having already boasted that Brussels can threaten to force the British into the backstop if they do not agree to surrender their fishing waters. The Tory MP warned that this would result in a situation where the EU could refuse to “let Britain out of jail until we have satisfied [Macron’s] demands for UK fish” — as the backstop is legally indefinite and the Withdrawal Agreement bars Britain from leaving it without the EU’s consent. 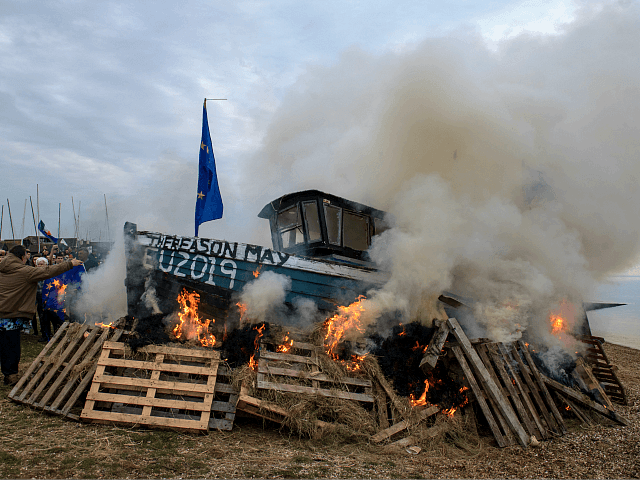 “This is not the freedom to run our own fisheries policy,” Johnson concluded.